Natchitoches...The Best Little Town in the USA ! In an effort to establish trade with the Spanish in Mexico, Louis Juchereau de St. Denis commissioned the building of a small fort on the west bank of the Red River near a village of the Natchitoches Indians in 1714. He selected that site because further navigation of the Red River was prohibited by a massive log jam. Natchitoches soon became a bustling river port and crossroads, giving rise in the 1800's to vast cotton kingdoms along the river. These affluent planters not only had magnificent plantations but also kept elegant houses in town so that they could attend social events. However, in the 1830's, the Red River changed its course and bypassed Natchitoches, leaving it without an outlet to the sea. Eventually, dams were built to separate the old river, now called Cane River Lake, from the Red River, further isolating the community. This isolation, while destructive to the cotton industry, actually benefited current Natchitoches residents, for there has been little out-of-character change in the city's National Landmark District and the beautiful plantations down Cane River. Today, this district overlooks the beautiful, meandering Cane River Lake, reminiscent of the time that Natchitoches was the largest fort on the Red River. 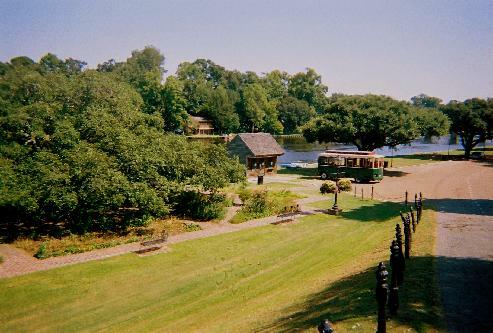 Full of French, Spanish and American influence, Natchitoches, with its picturesque setting, will delight all who visit.